Join professional player Mark Lavery as he takes you through a typical individual training session. These drills are guaranteed to help you improve fast. Your touch, technique, footwork, and confidence will drastically increase if you follow these steps! Players cover 8-12km during a match, consisting of 24% walking, 36% jogging, 20% coursing, 11% sprinting, 7% moving backwards and 2% moving whilst in possession of the ball (1). Soccer players posses excellent endurance with VO2max reported to range between 55 and 70 ml/kg/min in elite performers (2,3). The game is played at an average intensity close to the lactate threshold – approximately 80-90% of maximum heart rate (4,5). The greater a player’s aerobic capacity, the more ground they cover during a typical game (5,6). Additionally, improved endurance also increases the number of sprints completed in a game (7). By improving the VO2max of youth soccer players by 11% over an 8 week period, a 20% increase in total distance covered during competitive match play was manifested, along with a 23% increase in involvements with the ball and a 100% increase in the number of sprints performed by each player (5). What about other forms of conditioning? Strength training now plays a major role in soccer. However, simply lifting weights with the traditional “3 sets of 10 repetitions” approach is not an efficient way to spend training time. 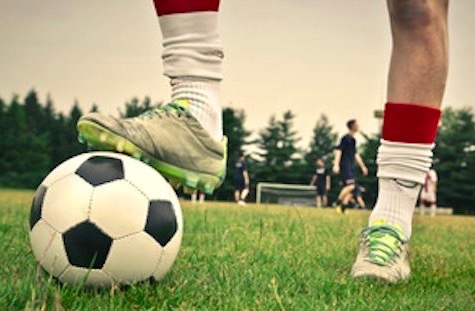 Soccer requires a balance of explosive power and muscular endurance. Some players may benefit from increasing their lean mass but even they should focus on converting much of their strength into soccer-specific power. Strength training for soccer also helps to correct muscle imbalances. Soccer players in particular are prone to developing overly strong quadriceps in relation to their hamstrings and a well-formed strength plan can address this and prevent future injury (8). The articles below cover all the important forms of soccer training and conditioning. Strength and endurance training is covered in-depth as well as sample speed and agility sessions, flexibility training and warming up and cooling down.